Rhiannon Armstrong, The Lullaby Directory at The Yard Theatre, London. Photo by Ben Gregory. Cradled is an immersive sound performance that explores intimacy without social interaction. 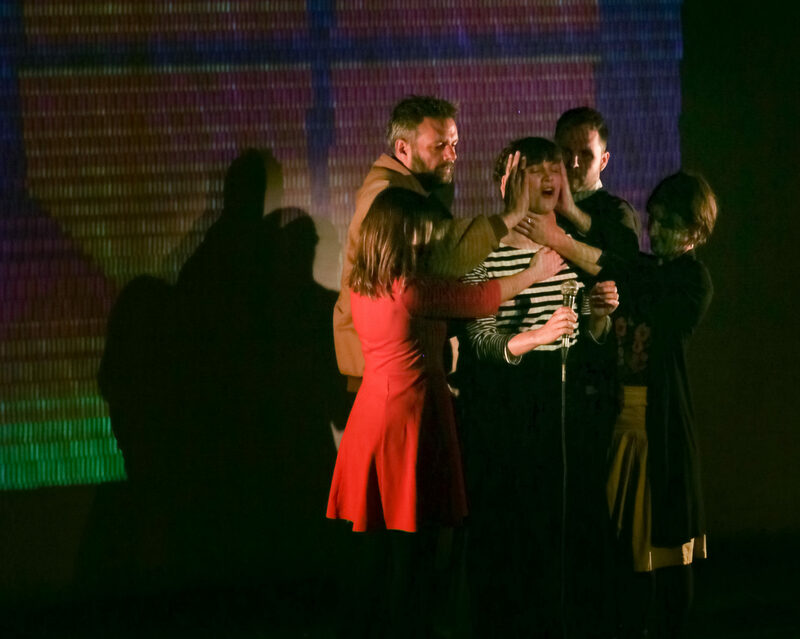 The project is led by award-winning live artist Rhiannon Armstrong, who specialises in intimate performance work for inclusive audiences – in partnership with Oily Cart. Cradled draws on research by Anne Fernald (Head of Infant studies at Stanford Center) which asserts that “sound is touch at a distance”. The project will work to create an emotive sensory performance which audience feel through their whole body, using resonating sculptural platforms which the audience can sit or lie on. Extended duration allows audience members to come and go, and considers those who might take up to an hour to get in the room due to anxiety. Cradled will be richly inclusive, considering and collaborating with those with complex needs throughout the process, and exploring sustainable performance formats for the artist. The piece will be flexible and adaptable for different settings, and artistically accessible to audiences of all ages.